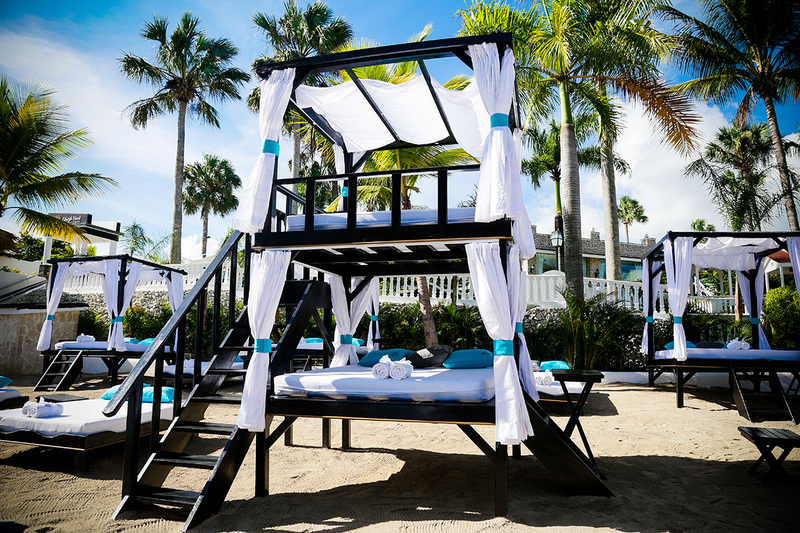 Book VIP at Cofresi Palm Beach & Spa Resort for access to these two-story cabanas on Lifestyle Beach. Cofresi Palm Beach & Spa Resort is an all-inclusive resort in Puerto Plata, on the northern coast of the Dominican Republic. The resort is located on the beach, near golf courses and a dolphin encounter park. The resort appeals to all ages – with 12 pools, a special adults-only section including spa suites, and family-friendly rooms with a kids’ club. There are over 450 rooms at Cofresi Palm Beach & Spa Resort, ranging from adults-only spa suites to family-friendly rooms located near the kids’ pool. All rooms have air conditioning, marble floors, and ceiling fans. Some rooms also feature kitchenettes, spa tubs, and patios or balconies. The resort has a buffet restaurant, and large variety of a la carte dining options. Specialty restaurants include Asian fusion, Mexican, seafood, Indian, and Brazilian. Cofresi Palm Beach & Spa Resort also offers a great selection of bars, with a rum bar, tequila bar, whiskey bar, and gin bar, plus a number of swim-up bars. There’s even a bar specializing in frozen tropical drinks. Activities at the resort include non-motorized water sports, an introductory scuba lesson in the resort pool, nightly entertainment, tennis, and golf. There’s also two spas and nightclub. Kids can enjoy the kids’ club, with daily supervised activities, two pools, a mini-disco and playground. Fly into Gregorio Luperón International Airport (also known as Puerto Plata Airport), Dominican Republic (POP). The resort is about 30 minutes from the airport. The resort offers free valet parking. Visit Cofresi Palm Beach & Spa Resort’s website for more information.